Skip the boring side dish. This heat-and-eat sweet-potato dish livens up dinnertime—and serves some eye-boosting nutrients to boot. 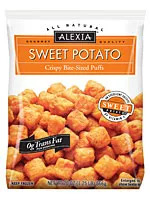 The taste factor: The bite-size puffs are crispy on the outside and light and fluffy on the inside. The sweet-and-savory nibbles are a perfect match for barbecue dishes, or this kicked up salmon recipe. The health factor: Tastes like a splurge, but 2/3 cup of these bites has fewer than 4 grams of fat and keeps the sodium light. Plus, sweet potatoes are rich in vitamin A and beta-carotene, to keep vision sharp. Editor’s pick: For a quick and easy hors d'oeuvre, serve with a jarred curry dipping sauce—the classic flavor combo adds a little zest to cocktail hour. Why we love it: These puffs are ready after just 20 minutes in the oven, taste like a splurge, and keep the calories and fat in check.